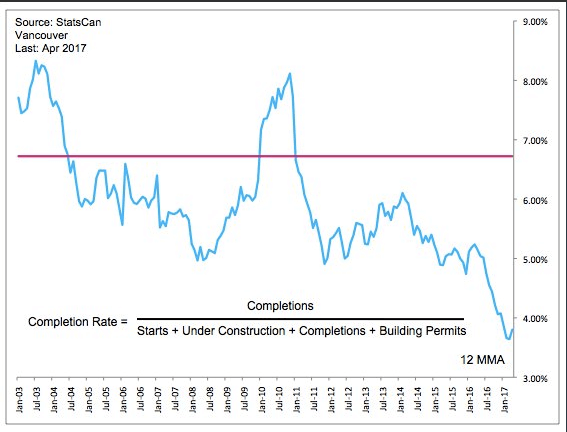 Recent data suggests housing starts are falling midway through 2017. From January through May, new housing starts fell from 10,860 in 2016 to just 9104 in 2017. That’s good for a 16% drop year over year. This is hardly surprising as trying to match our record housing starts in 2015 and 2016 would be hard to do. This historical housing boom has left an avalanche of new supply in the pipeline. 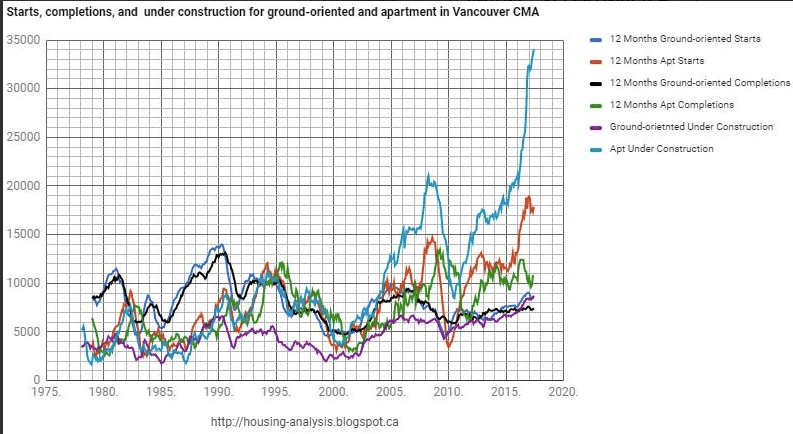 There are currently a whopping 37,009 units under construction in Greater Vancouver. That’s up nearly 26% year over year. This graph highlights just how unprecedented the numbers are. It seems developers are struggling to keep up as projects are continuously being delayed. Such as Kensington Gardens which is experiencing a flood of assignments. Either that or they don’t want an avalanche of new supply hitting the market at the same time. As we can see below, the completion rate has never been lower.